I’ve wanted to watch The Best Exotic Marigold Hotel when the British film was still showing in cinemas around late June/early July. I remember reading reviews of it and thought: “This sounds like a heart-warming feel-good movie that should make us laugh and enjoy our two hours in the cinema.” Plus, I had watched Salmon Fishing in the Yemen before that and absolutely loved it. The Brit irony and sarcastic wit was hilarious. I was silent after that. It’s a movie. It has subtitles. Besides, you’re supposed to put your brain at the door and be entertained. How hard can it be to understand spoken English? Anyway, we didn’t watch it together in the end. But I’m so glad I managed to finally watch the movie. The Best Exotic Marigold Hotel is a 2012 British comedy-drama film that was based on the 2004 novel These Foolish Things by Deborah Moggach. 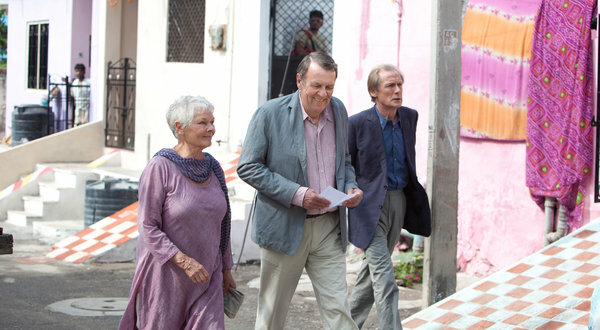 The two-hour long film features an ensemble cast including Judi Dench, Bill Nighy and Maggie Smith among a group of British pensioners moving to a newly opened retirement resort in Jaipur, India. However, upon their arrival, the seven financially distressed and retired Brit men and women discover the Best Exotic Marigold Hotel is far from the luxurious retreat “for the elderly and beautiful” that its advertising claims. Despite not meeting their expectations, most of them take it in stride and begin to flourish in their new-found adventure, letting the trip change their lives forever. Each of them has a sad story that forces or influences them to head for India (read brief sketches of them here.) Most of them can’t afford the high living expenses needed to retire in England. They miss home and their children, but they can’t go back. It made me realise I should save more money and worry about building my retirement nest, instead of splurging on materialistic items that would probably not last long enough as heirlooms. There are pleasant surprises. One of them was Graham Dashwood, a retired High Court judge, who grew up in Jaipur and is returning for the first time since his youth. Turns out he is a middle-aged gay man who’s “more in theory than in practice nowadays”. Graham hopes to reconnect with his Indian lover, whose family was disgraced when their affair was discovered. He has loved him his whole life, thinking that he had lost the love of his life forever and wanting to make up to him if he could ever find him again. And he does find a happy ending, but not what you’d expect. This is a feel-good film whose optimism and sentimentality gives me hope that it’s never too late to leave my comfort zone and explore new horizons, as long as I’m willing to go with the flow. Evelyn: Nothing here has worked out quite as I expected. Muriel: Most things don’t. But sometimes what happens instead is the good stuff. Evelyn: The only real failure is the failure to try, and the measure of success is how we cope with the disappointment, as we all must. Because in the end no matter what happens, whether it’s good or bad, life will still go on and you will be fine. Really. Sonny: Everything will be all right in the end. So if it is not all right, then it is not yet the end.